SEATTLE -- Scientists studying Puget Sound orcas for the past decade now know they are among the most contaminated marine mammals, with pollutants particularly high in young killer whales, according to a report released Wednesday. The report by the National Oceanic and Atmospheric Administration summarizes a decade of research findings that reveal the mysterious lives of a small population of endangered killer whales that frequents the inland waters of Washington state. 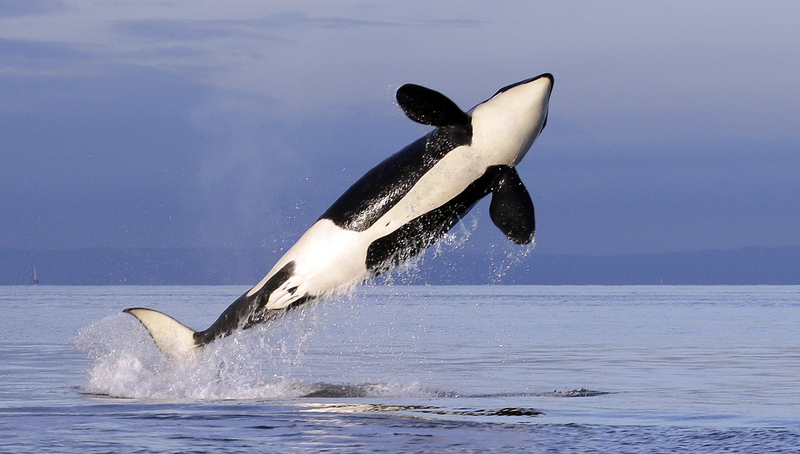 It shows that the orcas prefer to eat Chinook salmon and also consume fish such as halibut; hunt less, travel more and call louder when more vessels are in the area; head to the outer coast during the winter, foraging as far south as Central California and eating salmon from the Columbia and Sacramento rivers; and have high levels of banned pollutants such as PCBs. Yet, despite recovery efforts including new rules that prevent vessels from coming within 200 yards of any orca and designated critical habitat, scientists say the orcas continue to struggle to recover and more long-term work needs to be done to ensure survival. The unique population, known as southern resident killer whales, numbered more than 140 animals decades ago, but declined to a low of 71 in the 1970s when dozens of the mammals were captured live to be displayed at marine parks and aquariums across the country. In 2013, there were about 82. The striking black and white whales have come to symbolize the Pacific Northwest and play an important cultural and spiritual role for many Northwest tribes. Until recently, scientists didn't know exactly where orcas went in the winter months. Using acoustic monitoring and satellite tags, they've been able to track the orcas movements as they moved up and down the coast. Scientists have also found that Chinook salmon from the Fraser River in British Columbia make up the bulk of their summer diet. Genetic tools have been used to understand what the orcas eat, how they mate and their relationship to each other. "We are in a much better situation with the information we have now," Lynne Barre, NOAA Fisheries Seattle branch chief, said during a telephone call with reporters. Mysteries remain, though, including why this population hasn't grown; why certain whales die; and how high contamination levels impact a whale's health and reproduction. Orcas were listed as endangered in 2005, after local and regional efforts began in the 2000s to conserve them. Scientists came up with a recovery plan in 2008 after finding that orcas face three key threats -- lack of prey, pollution and disturbance from noise and vessel traffic. "We've made some significant progress in understanding each of the three primary factors of decline," said Mike Ford, director of the Conservation Biology Program at the Northwest Fisheries Science Center. From 2003 to 2012, NOAA spent about $15.7 million on research and conservation projects, the agency said. Killer whales can be found in many oceans, but the distinct Puget Sound population can be found most summer months and fall in Washington state waters. They primarily eat fish, rather than other marine mammals. They travel in three families, or the J, K and L pods. Whales from the same pod tend to spend most of their time together.